Faced with secular activists’ furor over the separation of church and state, the Air Force recently shelved a mandatory ethics training for nuclear missile officers following a report that the session employed Christian theology and Bible verses. destruction. The Air Force shouldn’t be bullied into shelving its theologically-grounded ethics training. But it should fix it. I write these words from Hiroshima, where I am visiting on the eve of the 66th anniversary of the first wartime use of the atomic bomb. The city is a stark reminder of what happens when we abandon moral standards that have guided us for centuries. The Air Force presentation cited in the report claims that the Christian “Just War” tradition morally authorizes the use of nuclear weapons. This is categorically untrue. And if we ask military officers, many of whom are Christians, to serve in good conscience, it cannot be on the basis of false teaching. Over the centuries, the Just War tradition has wrestled with when and how force may be morally applied, in a fallen world, toward the purpose of the greater good of peace. Unfortunately, the Air Force slideshow fatally amputates half of Just War by only mentioning the jus ad bellum criteria, which concern when and why war may be waged. It entirely omits Just War’s jus in bello criteria — the standards governing how war is waged — chief among which is the absolute prohibition of intentionally harming noncombatants. Given that the slideshow later admits that a U.S. nuclear launch “would kill thousands of non-combatants,” the omission may be unsurprising. However, it is theologically unconscionable and has profound real-world effects. The “Just” in Just War is not about justification, but justice–it is not there to salve our moral conscience, but to ensure that we do not forget the unrelenting standards of God even in the prosecution of war. The Air Force slideshow demonstrates the consequences of getting this moral teaching wrong. After showing a collage of Hiroshima dead that includes babies and the elderly, the presentation proposes mitigating factors, including post-war testimony by Germans and Japanese that they would have used the atomic bomb if they had developed it first. But it is appalling to hold up the wartime authors of the Holocaust and the Bataan Death March as benchmarks for relativistic ethics. 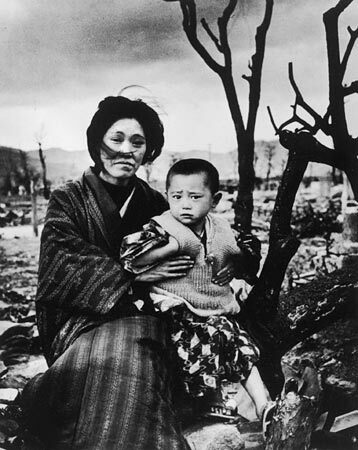 To justify Hiroshima with the assertion that Germany or Japan would have acted similarly is to betray the Just War tradition entirely. It means basing our moral standards on the fickle depravity of our earthly enemy, rather than the North Star of God’s goodness. And this is precisely what happened in World War II, with Hiroshima and Nagasaki forming a tragic coda to the escalating practice of civilian bombing initiated by the Nazis. Given their intimate knowledge of war’s physical and moral costs, those who bear the responsibility of waging armed conflict are often its most thoughtful and sober philosophers. It would be a disservice to deny our military the teaching of this biblically-grounded tradition in relation to nuclear doctrine-whether by omission or misrepresentation. We reject moral absolutes at our peril. The Air Force shouldn’t shy away from holding nuclear warfare up to Christian moral standards. But we should ask what the consequences would be if we actually told the truth about them.